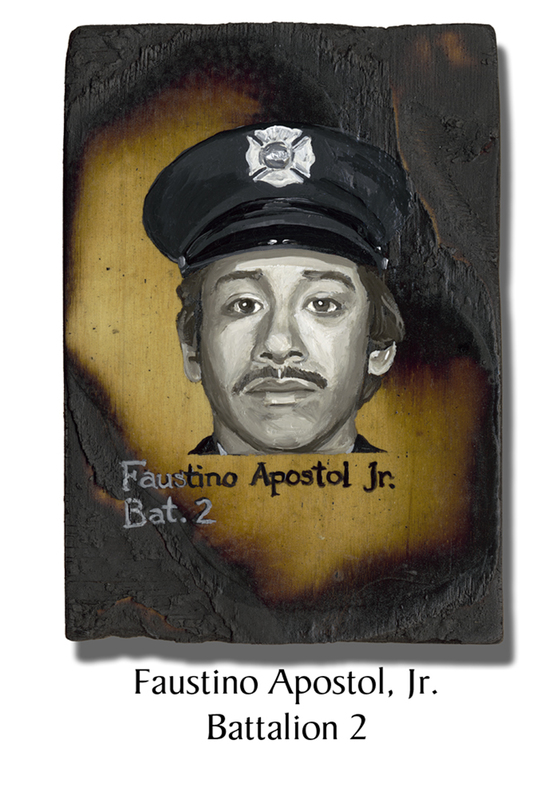 Faustino Apostol (“Faust”), was a firefighter with 28 years on the force. On the morning of 9/11, he was on duty with Engine 24/Ladder 5 in SoHo. He was the chief aide for Battalion Two. His first two grandsons were born six days apart not two years earlier. Faust was so tenacious he was able to talk his way into the delivery room at 2AM to greet the first of them. He and his wife, stepping gladly into their babysitting roles, converted a bedroom into a nursery, complete with fire engine sheets, fire hats and trucks. This entry was posted in Better Angels Stories and tagged 343, Battalion Two, better angels, Dawn Siebel, Faustino Apostol, FDNY, firefighter, firefighters, firefighters of 9/11, LODD, memorial, NFFF, paintings, World Trade Center, WTC. Bookmark the permalink.